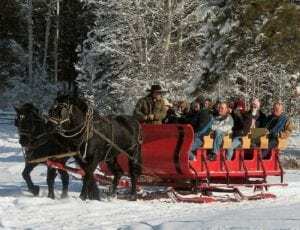 Horse Drawn Sleigh Ride Adventure! Cuddle up for a ride in a horse-drawn sleigh through snowy meadows and enjoy spectacular mountain and river views, as you’ve never seen them before. Daily trips are affordable and fun! We’re happy to make reservations for you. In the evening, cuddle up by the fireplace in your private room, or soak in the jetted tub (in our king suites). Sleep in, then enjoy a delicious breakfast in our great room with stunning views over the Cashmere Valley. This entry was posted in Outdoor Activities, Romance by innkeeper. Bookmark the permalink.